Bears cornerback Deiondre’ Hall was one of two NFL players arrested after an alleged fight outside a bar in Iowa early Sunday, according to police. Just before 1 a.m., officers responded to an altercation outside Sharky's Fun House in Cedar Falls, where the University of Northern Iowa is located. Officers attempted to remove him from the crowd, but police said he refused to respond and attempted to escape. Mugshots of Deiondre Hall (L) and Makinton Dorleant, who were arrested early Sunday in an altercation outside a bar in Cedar Falls, Iowa. Authorities said Hall was “yelling and spitting in the face of the officers,” there was a strong odor of alcohol on his breath and he was slurring his speech. Officers handcuffed Hall, who police said was argumentative, resisted arrest and refused to get into the squad car. Hall was charged with disorderly conduct, public intoxication, and interference, according to police. During the incident, Green Bay Packers cornerback Makinton Dorleant, who played college football alongside Hall at Northern Iowa, attempted to grab Hall despite officers’ warnings. Police said Dorleant approached three officers individually, “yelling and waving his arms in a threatening manner.” He was “admittedly ‘jacked up’ on adrenaline,” the criminal complaint against him reads. Dorleant was also taken into custody and charged with interference, a misdemeanor. 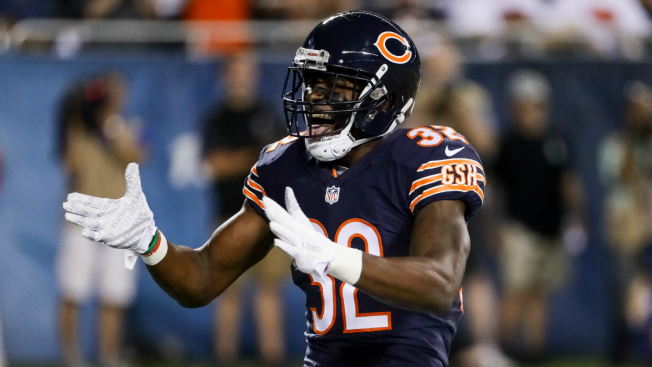 The Bears selected Hall in the fourth round of the 2016 NFL draft, though he suffered an ankle injury in October that sidelined him for much of the season. When reached, a spokesman for the Bears declined to immediately comment.